Nowadays, people are conscious about the healthy food, which is no MSG, No artificial colouring, and nutritious food. There is ever-increasing trend to add more vegetables to our dinning table in China. Healthy food recipe now favor and stressed on natural and fresh, which is expecially loved by those who like to consume light flavour food. It's a healthy life habits with consume less sugar and less meat. People should change their long hold prejudice about vegetables that they are just too ordinary and can't made to be delicious. That's just prejudice, since if be cooked in creative style, the vegetables could turn out to be outstandingly tasty. The most common material we utilize when making vegetable recipe is dofu, mushrooms, and carrots... Those are my favourites and they are very good for our health, and besides, they are very tasty. 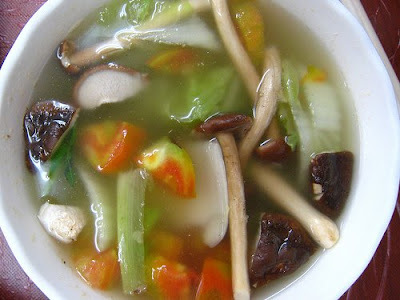 Mushrooms is often made to have the tasty of fish, or even better than fish. Dofu is a most famous representive of chinese food that make foreigners wonder and run at the mouth. Carrots is often been carved to make any styles and shape. So, taste more vegetables and learn how to cook them in a way you previously didn't know, enjoy them and embrace a better lifestyle that with less meat. Anyway, it also can help weight control, good news for the women.